Skate Your Way to Lower Blood Sugar Levels! Americans struggle with Diabetes and keeping it under control, but there are many different methods to keeping it managed. Regular physical activity is among the most important ways to keeping blood sugar levels within a healthy range. This helps the body use insulin more efficiently and effectively. When making the decision to start exercising, it is important to find a workout routine that you enjoy. We all know how easy it is to fall of the bandwagon. Skate Moore in Moore, OK, is the perfect destination for you! Roller skating is a great way to exercise and will be a physical activity you look forward to! Fun – Roller skating is a fun activity for people of all ages. Whether you’re 5 or 85 lacing up and rolling around the rink is a truly enjoyable and addicting experience! 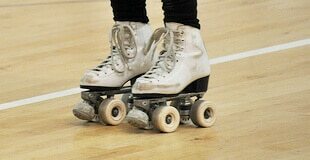 Easy to Pick up – Some might think that roller skating sounds great, but might be too afraid to give it a try. Roller skating is really easy to pick up though! Once you know the basics, you’ll be well on your way to skating greatness! Affordable – Getting a gym membership can be a costly monthly expense. Admission for roller skating is something that won’t break the bank though! And if you are really watching those pennies, some admission is cheaper than others. Check out our hours and see which ones fits in with your budget. Great Workout, Short Time – Roller skating is a great way to get a great workout in a short period of time and not even realize you’ve exercised. One hour of roller skating can burn up to 650 calories!